Colette Marence is a Breton monk and an instructor at the College of Winterhold. She is the expert trainer in Restoration, able to train you to level 75, and sells several Restoration spells. She wears master robes of restoration and a pair of boots. She knows a number of spells, namely Stoneflesh, Conjure Flame Atronach, Sparks, Close Wounds, Steadfast Ward, and Turn Lesser Undead. Colette can be found in her room on the second floor of the Hall of Countenance, especially during the later hours of the night. During the day, she can also sometimes be found sitting in the Arcanaeum, especially in the morning. She is extremely paranoid about being ridiculed by her peers at the college due to her study in Restoration magic. Upon first meeting her, she will appear highly agitated and demand: "You consider Restoration a valid school of magic, worthy of study, don't you? Don't you?" You can agree with her entirely, to which she will appear relieved and say: "Good, good. Not that I require validation, of course. There are just some - and I shan't name names - who would disagree. It can make life difficult when one's colleagues fail to recognize the research one engages in." If you disagree with her, she will taken aback, and say: "I... I see. Well, I'm glad we've established this early, rather than me hearing about it years or decades later when the whispers behind my back are loud enough." Asking her if she is treated badly because of her work, she will say: "Well... No. Not really. Not directly, I mean. But I know things are said behind my back. Conversations cease when I enter rooms. I'm quite aware of what's going on here, and I will not stand for it!" You may also ask her to explain further, confused, to which she will say: "It's quite simple really. There are some who shall not be dignified by being named, who have implied that it is not. That is to say, it's been suggested that resources used for my study of Restoration could be put to better use. Any other use, in fact. It's not just healing cuts and bruises, you know. The undead are a very real, very dangerous threat and Restoration magics can keep them at bay. Not to mention the benefit of wards! How can they continually overlook wards! It's baffling!" When beginning or ending a conversation with Colette, she may say either: "Why are my research materials constantly disappearing? ", "Once again, I have found very insulting notes left in my personal effects. Simply barbaric. ", "Just because I don't fit in here is no reason for others to ridicule me behind my back. ", or "Restoration is a perfectly valid school of magic, and don't let anyone tell you otherwise!" Colette: "Ah, my dearest Urag! How are you today, my green-skinned friend?" Urag: "Did you need something, Colette?" Colette: "I only wish to escape the constant glaring of my 'colleagues' and discover an opportunity for repose. Your Arcanaeum is so lovely and quiet..."
Colette: "Don't fret, my fanged acquaintance. I shan't trouble you a bit." Urag: "Was there something specific you needed?" Colette: "I'm positive whatever I require will be revealed to me on its own, in due time." Urag: "So, you don't need anything then." Colette: "Oh, my dear Urag. You're trying so hard to help. I do hope you're not disappointed." Urag: "'Disappointed' is not the word I would choose, Colette. Excuse me." Colette: "How are you, Drevis?" Drevis: "Ugh. What do you want?" Colette: "Why should I want anything? Why can't I simply be sociable with my colleagues?" Drevis: "I'm busy right now, Colette." Colette: "Well, then. Fine. Have a nice day." When you speak to Mirabelle Ervine for the first time, she will comment on Colette, saying "And finally, there's Colette. She may be... difficult to get along with, she's very knowledgeable when it comes to Restoration magic." If you ask her to train you in Restoration magic, she will say "I'll gladly share my knowledge with you." Restoration Ritual Spell: Find the Augur of Dunlain and learn more about Restoration magic. During the quest Good Intentions, you can ask Colette about the Augur of Dunlain, to which she will respond with: "The Augur? Tragic story, really. At least, the way I heard it. But that was a long time ago. It was some experiment gone horribly wrong. Ghastly results, I was told. And his ghost still roams the halls, they say. Of course, on further reflection, that may have simply been an attempt to scare me. Hmm. Perhaps I'll ask Tolfdir what really happened. I understand he was here at the time." During the quest Containment, Colette will be standing with other members of the College, and will say "This can't be happening!" During the quest The Staff of Magnus, while leaving the Hall of the Elements for the Labyrinthian, Colette will say to you: "You'll defeat Ancano, won't you?" During the quest The Black Star, you can ask Colette if she knows of an Elven mage in the college that studies stars. She will respond with: "Why would anyone bother to study stars? Well, unless you're talking about that artifact that got all those... dimwits thrown out." Asking her what happened, she will say: "Oh, no, I'm not falling for that one again. Next thing I know, I'm getting yelled at for saying something inappropriate. If you're so curious, talk to Nelacar, in the Frozen Hearth. He can tell you the whole sad story." If you tell her that you were given a vision, however, she will say the same thing, but worded slightly differently: "Oh no, I'm not talking about that. I'm not being blamed for saying something out of place. Again. If you want to know, ask Nelacar. He's staying at the Frozen Hearth. Knows the whole sad story." "I would just like to remind everyone, once again, that Restoration is indeed a valid school of magic. It is absolutely worthy of research, despite many of the notes I've had left in my bed. And my desk. And on occasion, my meals. Anyone suggesting that Restoration is better left to the priests of the Temples, I think, is forgetting a few things. Firstly, the ability to repel the undead cannot be ignored. Skyrim is well known to be full of these... Draugr, ancient Nord warriors who cannot find peace. I submit that everyone in this College has, at one time or another, relied on one of the Restoration spells that can keep them at bay. Secondly, how can anyone forget wards? They have become essential to any mage working in dangerous situations. They are counted upon every bit as much as Candlelight, or Invisibility. But more importantly, wards have saved lives. This is a simple fact. 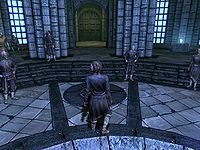 Every mage in this College regularly uses wards for practice, so as to avoid physical harm. I truly hope that these points actually sink in, and that more care and thought is given to this subject in the future. Thank you." Upon reaching level 90 in Restoration, and after completing the quest Good Intentions, you can ask Colette if there is anything more to be learned within Restoration. She will appear very pleased with you, saying: "Look at you. Such a devoted student of Restoration. It's comforting to see that not everyone has dismissed it as entirely as most members of the College. Truly comforting. It looks like you're ready to speak with the Augur." You can either ask what the Augur has to do with it, prompting her to say: "Oh, didn't you know?" or you can claim confusion, telling her your thoughts that she was the authority in Restoration, to which she will say: "Oh, goodness no. There are those far more skilled than I." In either case, she will continue, saying "The Augur was a brilliant mage. Truly inspired. Mastered spells others could barely comprehend. He was especially gifted when it came to Restoration. He's... Well, he's very particular about who shares the knowledge. So you'll need his approval first. Go on, go talk to him. I'm sure he's been paying attention, and will be expecting you." This is the merchandise found in Colette's merchant chest. These items are only available if purchased from the merchant; they cannot be pickpocketed or stolen. They are restocked every two days. It seems that when Colette is trying to get past the protective ward in The Eye of Magnus she can actually run off the bridge if you don't get it down fast enough. She will lose her path if this happens and remain where she lands until found. Using Detect Life under the bridge of the college should allow you to find her if this is the case. By pushing her far enough towards the town (not the college), she will eventually pick up the path back to normal life. 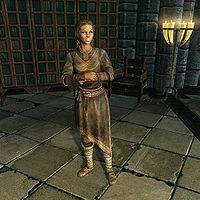 Colette Marence also appears in the Heroes of Skyrim card expansion for Legends, as the card Restoration Tutor, although her race does not match. This page was last modified on 11 March 2019, at 22:02.